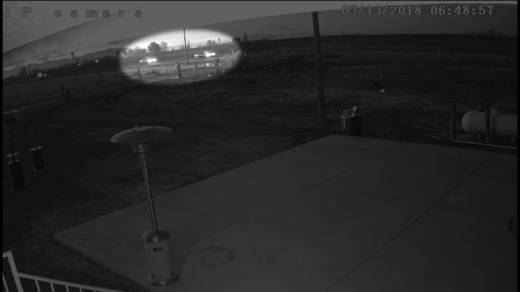 A surveillance video obtained by KQED shows U.S. Immigration and Customs Enforcement agents had their emergency lights on as they drove behind two farmworkers early on March 13 in Delano, a short time before the driver and passenger of the fleeing Ford pickup truck were killed in a car crash. 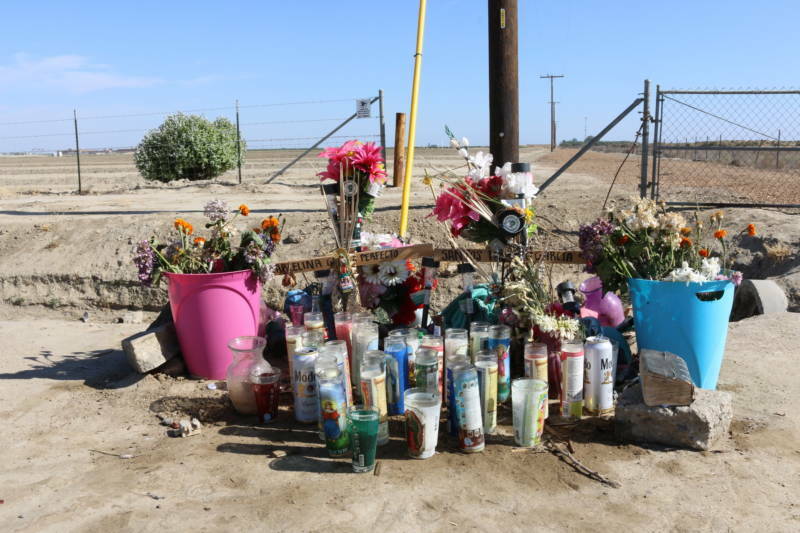 The video, collected by police from a private residence, contradicts statements two ICE agents made to Delano police after the vehicle they were following crashed, killing both Santos Hilario Garcia, 35, and his wife, Marcelina Garcia Perfecto, 33. The couple had six children, ages 8 to 18. An ICE spokesman would not confirm what the agency’s pursuit policy is, or that the agency even has such a policy. However, federal regulations for the U.S. Department of Homeland Security — which oversees ICE — available from the Government Publishing Office indicate that ICE agents, unlike border patrol agents, are not typically authorized to engage in vehicular pursuits. Geoffrey Alpert, a professor of criminology and expert in police pursuit driving at the University of South Carolina, said the video depicts an obvious law enforcement pursuit. The video shows a truck believed to be driven by Hilario Garcia traveling westbound on West Cecil Avenue at a higher speed than other cars. Ten seconds later, two vehicles with flashing lights appear, driving in the same direction. A civilian vehicle was between Hilario Garcia’s truck and the ICE agents. The agents told police that they had followed Hilario Garcia’s vehicle from his apartment, believing he was someone else wanted for deportation, according to the police report. They turned on their emergency lights after Hilario Garcia turned west onto West Cecil Avenue from Hiett Avenue, and the pickup truck initially pulled over. But when the agents got out and approached on foot, it sped off. ICE agent Sanchez said he followed the car "for approximately 15 seconds" after the stop, according to the police report, before pulling over and talking with Benitez, who was in a separate vehicle. Minutes later, the couple’s truck crashed into a utility pole about 2.5 miles west of the spot where the agents had tried to pull over the truck. The vehicle flipped over, killing Hilario Garcia and Garcia Perfecto. Witnesses told Delano police that the truck was traveling west at high speed and passing other cars using both the eastbound lane and the westbound dirt shoulder before it crashed. The surveillance video was acquired by police from a private residence almost exactly halfway between the site of the traffic stop and the crash scene. Three witnesses told police they did not see law enforcement following the truck before it crashed. The Delano Police Department referred the case to the Kern County District Attorney’s Office for review in April, requesting criminal charges based on the contradiction between the video and the agents’ statements that they were not in pursuit. Knowingly giving false information to a police officer can be charged as a misdemeanor under California’s vehicle code. 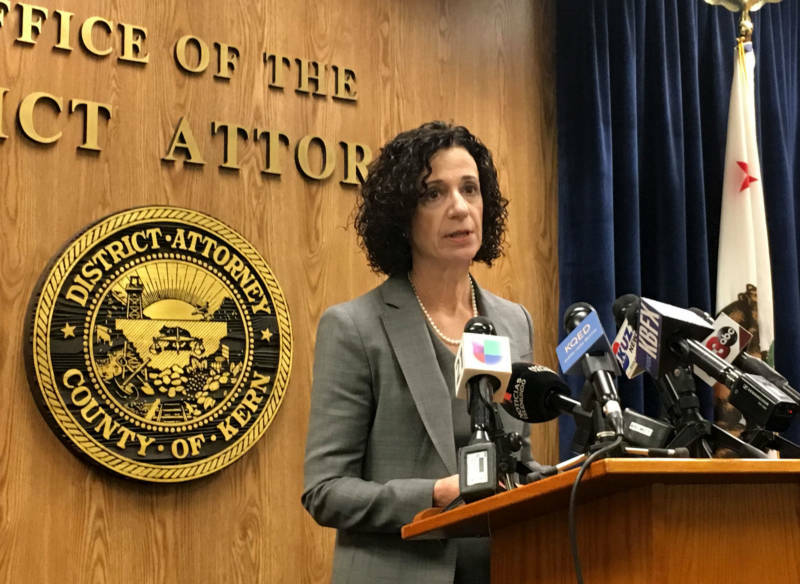 Kern County District Attorney Lisa Green said on April 18 that her office would not bring charges against the agents because there was no credible evidence the agents lied. "It appears to me, from my review of the surveillance video, that both agents were obeying traffic rules. And in the relevant 10-second clip that was provided to my office, neither agent’s vehicle appeared to be overtaking the Ford," Green said. Green referenced the statements from witnesses who said Hilario Garcia’s car was not being chased by law enforcement in the moments immediately before it crashed. To charge the agents, Green added, any false statement made to a peace officer must be material to the incident. “The only way they could be considered material is if the pursuit with lights and sirens was a factor in the cause of the accident,” Green said. Criminology professor Alpert said the space between the agents and the fleeing vehicle has no bearing on whether they were in pursuit. An ICE spokesperson said agents were tracking the victims of the crash because Hilario Garcia matched the description of a person they were looking for. It turned out the agents had the wrong man. In a statement, an ICE spokesman called the crash “isolated and extremely unfortunate,” adding that California’s sanctuary policies have forced its agents out of the jails and into communities, increasing risks to law enforcement and the public. ICE agents recently returned to the same apartment complex where Hilario Garcia and his wife lived with their children to arrest Hilario Garcia’s brother, Celestino, who had been deported twice before and had three criminal DUI convictions and was the agents’ original target. He was deported to Mexico the same day.